Alan Yang has served as Principal Cellist of the South Bay Symphony Orchestra conducted by Christopher Hill. He was also a faculty of California Youth Chinese Orchestra. He has been teaching private cello lesson since 2002 and has also taught in Fremont Hopkins Junior High School in the beginner and intermediate string orchestra. His students have won several Cello competitions, including CMTANC International Music Competition, United State Open Music Competition and American Protégé International Music Talent Competition. His students have also participated in various youth symphonies including SJYS, CYS, ECYS,SFYS and CODA All -State Jr High School Orchestra. In 2018, His former student Michael Song has been accepted by Curtis, Juilliard, Colburn, New England, Cleveland and Glenn Gould Music School with full scholarships study Bachelor of Music in Cello performance. Mr. Yang was born in China to a family of musicians. 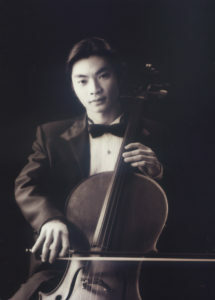 He received his bachelor’s degree from Wu-Han Conservatory in China and continued to achieve his Master’s degree and Artist diploma in Cello Performance from Indiana University in U.S.
During his study at the Wu-Han Conservatory, Mr. Yang was a member of the East symphony Orchestra and the East Chamber Orchestra. In 2001, he proceeded to become a member of the first China Cello Orchestra, led by the Swiss Cello master Albert Roman. He and twenty other highly gifted cello students were selected from China’s leading music academies. He went on to perform in Sils, Scuol, Luzern, and Basel in Switzerland, and Beijing, Ji Nan, Shanghai and Su Zhou in China. In 2002, Mr. Yang became a member of the Southwest Michigan Symphony Orchestra. He has accompanied many well-known musicians including Xu Zhong, Xiang-Dong Kong, Dickran Atamian, Albert Roman, Jian Wang, Robert Riseling, Akahoshi, Pip Clarke, Rachel Barton and Hye-Jin Kim. In 2003, Mr. Yang was invited to perform at the Elitist Concert, organized by the Texas Chinese Performing Arts Association. He was awarded the prestigious “Honor Citizen Certificate Award” from the Dallas city government. Born and raised in Taiwan, Ernest Yen began his violin lessons at the age of 5, under the tutelage of Kuei-Chu Chu. At age 11, he was featured as a soloist in the Butterfly Lovers Violin Concerto and toured Japan with Jhen-Si Youth Orchestra. At age 13, he was the youngest member of the Taiwan Youth Symphony Orchestra during its U.S. tour. Ernest served as concertmaster in orchestras through his study, and played Vivaldi The Four Seasons Violin Concerto and Mendelssohn Violin Concerto with National Tsing Hua University Orchestra, and Prokofiev Violin Concerto No. 2 with Bei-An Symphony Orchestra. 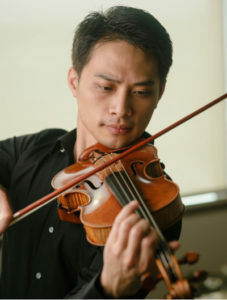 In 2002, he won the first prize in the violin category in the Taiwan National Music Competition. His string quartet also won the first prize in the chamber music category in the same year. Ernest moved to the U.S. to pursue his doctorate degree in 2006 and has been a member of the UC Berkeley Symphony Orchestra since then. He studied with Hagai Shaham, Alexander Barantschick, Catherine Van Hoesen, Chen Zhao, Franklyn D’Antonio, and is currently study with Yukiko Kurakata. He was threetime concerto competition winner and performed with the UCBSO as the featured soloist in several seasons, including the Tchaikovsky Violin Concerto in 2008, Saint-Saens “La Muse et le Poete” in 2010, and Korngold Violin Concerto in 2011, on a 1865 J.B. Vuillaume violin generously lent to him by the Music Department of UC Berkeley. In 2008, he was the Semi-Finalist of the KDFC Classical Star Competition. In 2010, he was invited to perform on the Four Seasons Arts “Cameo Concerts” program and performed with Miles Graber in the Yachats Music Festival in Oregon. He also plays frequently with the Berkeley Symphony, Symphony Silicon Valley, Master Sinfonia Chamber Orchestra, Palo Alto Philharmonic etc. Ernest Yen is currently living in San Jose. His students have won local music competitions / youth symphony auditions and performed in Carnegie Hall. Richard is a former member of the Singapore Symphony Orchestra. 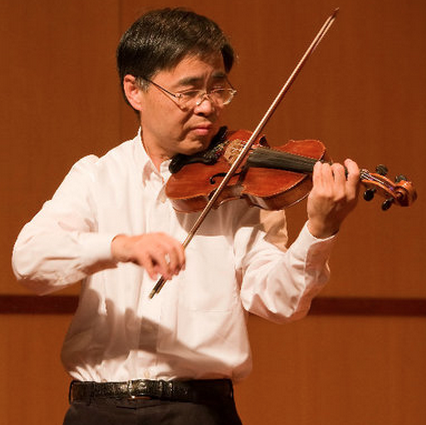 He has over 35 years of experience teaching violin & viola to all ages in various music schools including the Harker school in Saratoga and the renowned Music Office of the Government Secretariat in Hong Kong. He is experienced in ABRSM exam preparation for all levels. Dennis has been teaching Violin, Viola in the SF Bay Area for more than 15 years. He has tremendous experience helping students age 4 and up to learn how to play the Violin and Viola from the start. Dennis himself started learning how to play the Violin at the age of five from his father. His music mentors were classically-trained Violinists with many great violin pedagogies. Wei He, Antoine van Dongen, and Livia Sohn are the wonderful faculty with extensive experience who made Dennis very strong in his early ages of learning music. Dennis is committed to education and sharing his passion in music, so he focuses on performance techniques and expression when he teaches various levels of students from Beginner to Advanced Levels. Dennis uses his passionate styles in teaching teenagers and young adults to create a longstanding love of music and to provide a productive learning for them based on each individual’s goal and interest. Dennis also does preparation for the ABRSM Exams and School Orchestra Performances. Many of the students who took lessons from Dennis have eventually got admitted to a number of prestigious youth symphony groups such as California Youth Symphony (CYS), Peninsula Youth Orchestra (PYO), and El Camino Youth Symphony (ECYS), Fremont Youth Symphony Orchestra (FYSO), and Silicon Valley Youth Symphony (SVYS). Dennis, as an experienced Violin coach, mentor and an inborn music teacher, believes that establishing a profound foundation plays an outstanding role in a successful musical performance. Dennis builds up love, passion, and confidence in his students to play the Violin in their life as a real musician. He is an extremely patient, enthusiastic and passionate musician interested in coaching and encouraging his students to achieve artistic goals, always! Winnie is classically trained in violin and viola and has been teaching for 6 years. She graduated from University of California – Irvine where she studied music – viola performance with Dr. Jerzy Kosmala. Growing up in Fremont, she was part of the first Advanced Orchestra that formed at Hopkins Jr. High with Mr. Conway and was part of ECYS throughout all of high school. 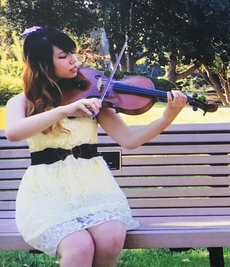 During her stay in Southern California, she taught a lot of students ranging from ages 5-35 and performed in a lot of chamber music concerts and weddings. In 2017, she was invited to perform at Richard Clayderman’s Concert as a violist. Winnie’s style of teaching is based on the student’s needs. Her goal is to help students express their emotions through playing, develop good discipline, enhance coordination, and practice efficiently. Her students have participated in San Jose Youth Symphony and California Youth Symphony Orchestra.